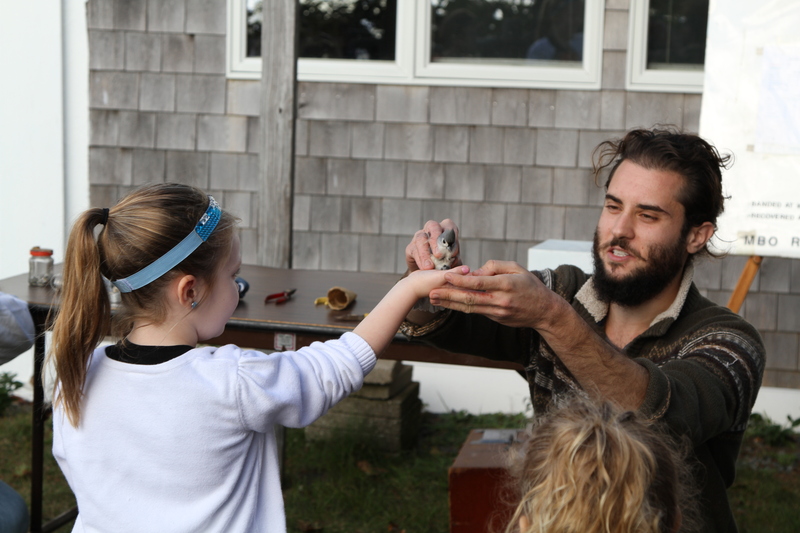 Bander Alex Bartolo releases a Tufted Titmouse, with the help of a visiting kindergarten student. Cursing the winds which knock battered and crunchy oak leaves into the mist nets, repairing gear and entering backlogged data indoors as Hurricanes Maria and Jose breathe their final remains over the Northeast coast, and catching the office staff’s infectious cough; these are some of the misfortunes faced by our Manomet banders this fall 2017 season. In light of these mild “bummers,” the team has still captured a colorful assortment of landbird species, ranging from Field Sparrows (uncommon!) to Red-shouldered Hawks (crazy uncommon!). Bander Kayla Baker measures the leg of a Red-shouldered Hawk to be banded. banders processed a Rose-breasted Grosbeak after a push of favorable winds following the dissipation of a hurricane-related low-pressure system. This bird was a hatch-year male – not quite as brilliant as his older cohorts, who would show striking black plumage on the head and back and a white underbelly, in addition to the apropos rosy breast and underwing. An impressive season for birds of prey, the nets had the weighty task of securing five species of birds whose talons and bills are specialized to puncture and tear. These species included the fairly common Cooper’s and Sharp-shinned Hawks, three individual Eastern Screech-owls (two juveniles and one supposed adult female – mother and brood? ), a very unlikely Merlin (caught in the tip of a net propped along the edge of a bluff – probably hunting), and a massive Red-shouldered Hawk! As expected, a fall-out of hasty Blackpoll Warblers made short work of the berries and other fruiting bodies our 40 acres have to offer. Blackpolls, named for the males’ black “cap” in their breeding plumage, have one of the more intense migratory routes of all the birds we see at our banding lab, flying nearly 2,000 miles from the boreal forests of Canada to their wintering grounds in Central and northern South America. To accomplish this non-stop flight, they must first go through a period of hyperphagia, where they increase their rate of food consumption to stockpile the necessary energy reserves for their impending marathon. The fattest fellow captured this season was a podgy 24 grams – their normal average mass falls between 12 and 13. With only a few weeks remaining this season, we prepare to bid farewell to our seasonal team for another stellar fall. As always, the banders have done a top-notch job of entertaining and educating visitors and school groups, performing succinct data collection, and using most impressive judgment in the face of pop-up challenges (i.e., nets collapsing, children misbehaving, and their boss, Trevor, Director of Landbird Conservation, entering the lab at random and serving up countless bird-, culture-, and geography-related quizzes). To stay up-to-date on all the latest captures and happenings in the lab, follow the banders on Twitter and Instagram. The season officially ends November 15, so contact our office to schedule a visit to the lab before then. Hours of operation are Monday through Friday, sunrise to sunset.